President Donald Trump has postponed until at least April the supposed deadline for concluding the United States’ current trade negotiations with China. A good outcome for both sides would be reached if China agreed to protect property rights better and reduce the state’s role in its economy; the US agreed to strengthen national saving and public investment; and both sides agreed to reverse their recent tariff increases. Unfortunately, this is not the deal that is likely to materialize. For starters, Trump fixates on the bilateral US merchandise trade deficit. The Chinese could probably deliver on the verifiable -- but worthless -- step of committing to buy more US soybeans, natural gas, and other commodities. But this would have little or no effect on the overall US trade balance, because the US would export less soybeans and natural gas to other countries. Congressional Democrats would rightly point out that the gain was illusory, again highlighting the irrelevance of bilateral trade balances. The more meaningful measure -- the overall US trade deficit -- widened last year, the predictable result of Trump’s budget-busting fiscal policy. The US and other countries have more legitimate complaints against China regarding technology transfer and intellectual property rights. The effective way to pursue these grievances would have been in cooperation with allies, via multilateral institutions such as the World Trade Organization Partnership. But Trump has gone out of his way to take the opposite approach, making progress difficult. It is not easy to detect a coherent rationale for US trade policy under Trump. If one exists, it most probably involves pushing China to restructure its economy by providing a greater role for the market, shrinking the state sector, and lessening pervasive government control. Certainly, this has been the overall approach of previous US administrations. Generally speaking, pro-market reforms would tend to be in China’s interest, too -- as many Chinese economists also recognize. A good example is government subsidies for steel mills and other heavy industry, particularly in the form of cheap loans from state banks. This was one component of China’s fiscal expansion in response to the global recession a decade ago. The subsidies left China with tremendous excess steel capacity -- bad for economic efficiency and foreign competitors. For 10 years, this position made sense. But in 2014, market forces changed direction. Since then, the People’s Bank of China’s has had to spend almost $1 trillion to stem the depreciation of its currency. Had the PBOC let the market work, as US politicians demanded, the renminbi would have fallen even further. The structural-reform component of the current US-China negotiations recalls similar talks with Japan three decades ago, which were prompted by congressional anger at the large US trade deficit with that country. In June 1990, under the Structural Impediments Initiative, the Japanese government agreed to a detailed set of policy reforms requested by President George H.W. Bush’s administration. 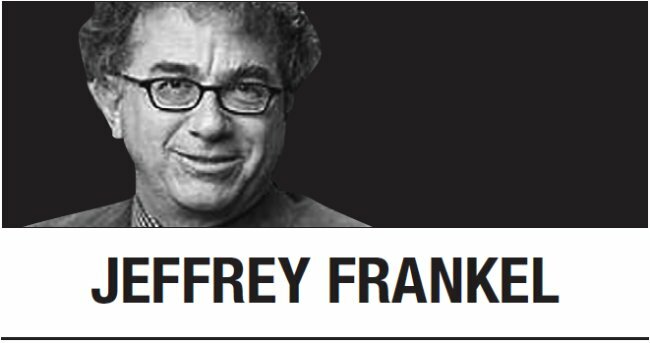 Jeffrey Frankel is professor of capital formation and growth at Harvard University. -- Ed.